In a medium bowl, stir together the Bisquick™ and milk, Asiago, bacon and rosemary until it forms a ball. Turn out the dough onto a floured cutting board and knead for 1 minute. Roll out with a floured rolling pin to 1/2-inch thick. Cut out biscuits with a 3-inch round cutter, re-rolling dough as necessary. Place the biscuits on an ungreased nonstick baking sheet. Bake for 8-10 minutes, until golden. Fresh, fluffy biscuits studded with bacon, rosemary and Asiago -- in just 20 minutes? You bet! Come on along -- we'll show you how! 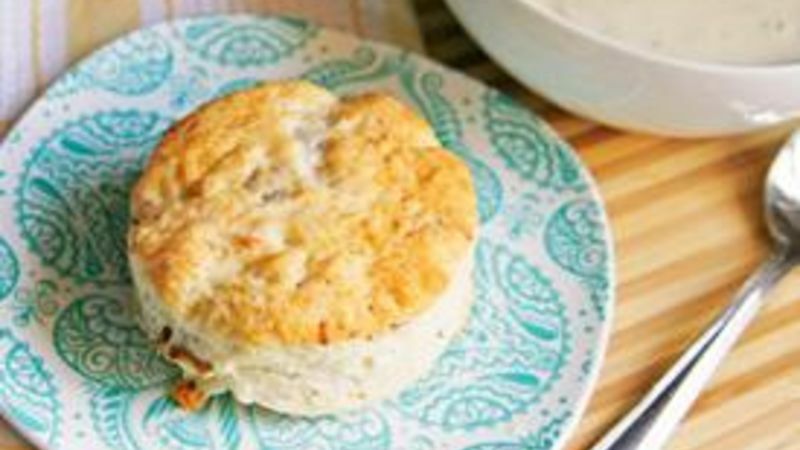 These Rosemary Asiago Bacon Biscuits start with Bisquick to make life extra easy. Here's all you need. Use precooked bacon if you are short on time. And don't worry -- with a sharp knife, chopping the fresh rosemary takes only seconds. Mix the Bisquick and milk in a medium bowl. Add the bacon, cheese and rosemary. Make it into a lumpy, rough dough. Then roll it out and cut 6 biscuits that are 3-inches in diameter. How easy and quick was that? Easy, beautiful golden biscuits ready to enjoy. Start with fresh ingredients. Old baking powder or baking soda can spell disaster for biscuits, so be sure that your ingredients are fresh. Knead the dough briefly.This is important, even if you are making biscuits from a baking mix. Work the dough with your floured hands on a floured board (it’ll be sticky – you need the flour to prevent it from sticking to anything). Your dough should look smooth, not rough, when you cut it, but you shouldn’t knead it more than maybe 10 times. Press the cutter straight down and pull straight up. The urge to twist is huge. I know. But if you twist the biscuit cutter, you seal the edges and prevent the biscuit from properly rising. Don’t do it. If you’re tempted, switch to fluted cutters!